If you are a member of the U.S. Armed Forces and are interested in becoming a U.S. citizen, you may be eligible to apply for citizenship under special provisions in the Immigration and Nationality Act (INA). The U.S. Citizenship and Immigration Services (USCIS) has created a streamlined process specifically for military personnel serving in active-duty status or who have been recently discharged. Normally, a noncitizen must have five years of legal permanent residency in the U.S. to apply. A noncitizen married to a U.S. citizen for at least three years can apply after three years of residency. However, special provisions apply for members of the Armed Forces. Under INA Section 328, people who have served in the U.S. military (including active duty, reserves, or National Guard) can file for naturalization based on their current or prior U.S. military service. The applicant must have served honorably or have separated from the service under honorable conditions, have completed one year or more of military service, and be a legal permanent resident at the time of his or her examination by USCIS on the application for naturalization, also referred to as Form N-400. Filing for naturalization under this provision of the law, Section 328 of the Immigration and Nationality Act of 1952, as amended, excuses the applicant from any specific period of residence or physical presence within the United States, so long as the application is filed while the applicant is still serving in the military or within six months of an honorable discharge. 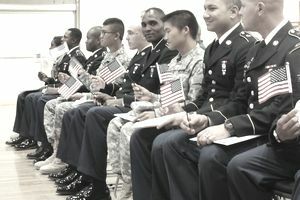 Anyone serving honorably in active-duty status in the Armed Forces of the United States at any time on or after September 11, 2001, until a date to be announced, is eligible to apply for naturalization in accordance with "the service during hostilities" statutory exception in Section 329 of the INA to the naturalization requirements. As a result, anyone with even one day of honorable active-duty service can apply for citizenship, regardless of how long they have been a resident. Section 329 of the INA also applies to service members who served on active duty during World War I, World War II, the Korean Conflict, the Vietnam Conflict, and Operation Desert Shield/Desert Storm. Under section 329a of the INA, noncitizen service members who die while serving honorably in an active-duty status during a declared period of hostilities, and whose death was as a result of injury or disease incurred in or aggravated by that service, are eligible for posthumous naturalization. An application for posthumous citizenship can be filed on behalf of the deceased service member only by the next-of-kin or another representative. If the application is approved, the individual is declared a U.S. citizen retroactively to the day of his or her death. Section 319(d) of the INA provides for the naturalization of the surviving spouse of a U.S. citizen who died while serving honorably in an active-duty status in the armed forces of the United States. No prior residency or physical presence in the United States is required to file a naturalization application under these circumstances. To be eligible for naturalization, you must be a person of good moral character, which CIS will evaluate. The law requires applicants to demonstrate an understanding of the English language, including the ability to read, write, and speak simple words and phrases in the ordinary usage of the English language. Applicants must show that they have a knowledge and understanding of the fundamentals of the history, principles, and form of government of the United States. Every military installation should have a designated point of contact to handle your application and certify your Request for Certification of Military or Naval Service (N-426). You should inquire through your chain of command to find out who this person is so that the person can help you with your application packet.